* Gobshite (also referred to as Gobbie, or Gobbies): One who engages in nonsensical chatter or unwanted conversation. For example- What’s that gobshite talking about now? Minelaying song sung by Rhodesian Sappers laying mines during Cordon Sanitaire operations, Mukumbura. I have absolutely no idea how I have remembered this song all these years. The most recent National Service intake of Sappers were referred to as Gobbies. 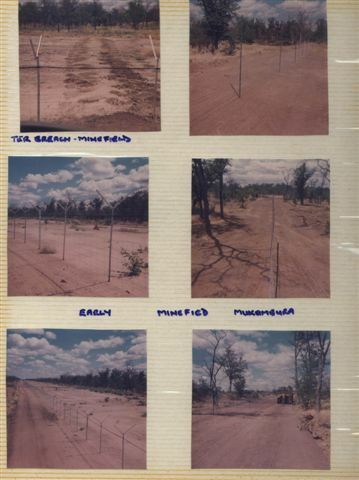 Below is a photo of the early Mukumbura minefield. Note the gook breach in one of them. Below is a gook infiltration map. Mukumbura is in the North-East. The object of Cordon Sanitaire was to use minefields and patrols to channel insurgents into designated areas from which the local population had been removed. They could then be tracked and killed before they reached populated areas. 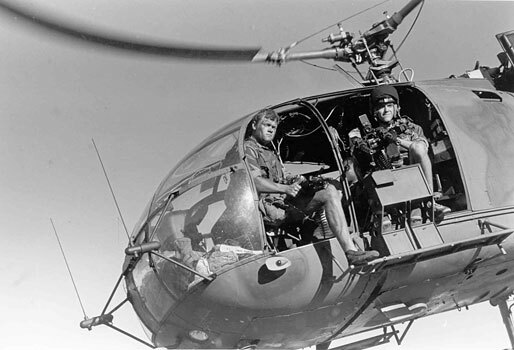 The first Operation Hurricane “no-go” area was along the Mozambique border in May 1973. 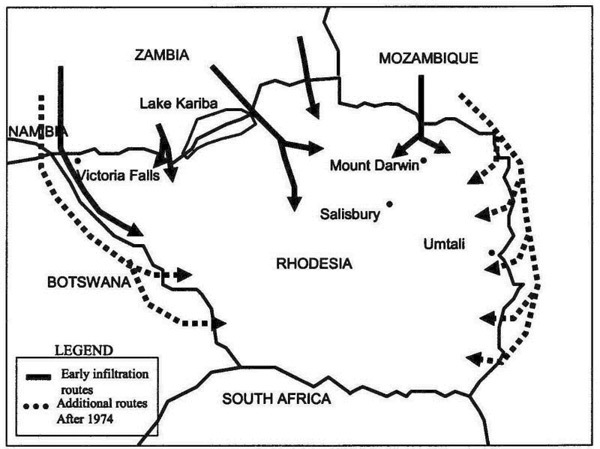 Other “no-go” areas were extended along vast stretches of Rhodesian border in an attempt to establish depopulated “free-fire” zones for Security Force operations. This concept that anyone seen moving in an area is considered a terrorist and can be killed was tried in some areas of Vietnam too but was not particularly successful. More to follow on Mukumbura in the next instalment. Besides landmine incident call-outs, the days at 1 Indep also consisted of camp guard duties, patrolling the married quarters at night, and escorting ration-runs to deployed call-signs in the Company area of responsibility. Late one afternoon this somewhat laid-back routine was, without warning, rudely interrupted. Contact had been made with a large group of gooks and they were on the run. Normally in these types of situations the general idea would be to get as many additional feet on the ground as quickly as possible to track the gooks and kill them. At the same time as the follow-up was taking place, stopper groups would be placed ahead of them and straddling their likely axis of advance. This specific aircraft had the callsign prefix of “Hornet” due to the twin Browning’s at the top looking very much like insect probiscae. These aircraft also carried Frantan bombs that acted very much like Napalm and it was a pleasure to see these being used. Gooks normally quickly lost the urge to do anything bad after one of these was dropped near to them. I had managed to get dragged into leading one of the stopper-groups this specific day and had been dropped off with whatever and whoever was available at the camp. The area that needed to be covered to catch the running gooks was so wide that we had cooks, medics, bottlewashers, and mechanics in the stop-groups. Remember that in the Rhodesian Army we were all Infantrymen first and specialists second. It was in these circumstances that the training model really paid off. By last light we were still lying there waiting for the gooks to run into us but nothing happened. It gets a little creepy in these situations as you need to be really careful not to shoot your own people chasing the gooks. With non-combat type troops with me this was a real possibility and I knew it. I was not quite sure what the next move was going to be and was hoping that we were not going to be expected to stay out the entire night. Due to the rushed and calamitous deployment, none of us who were normally non-Fire Force troops were carrying warm clothing or rations. As fate would have it I received a radio message that we needed to stay in position for the night. I informed the gentleman on the other end of the line that my callsign was not equipped for a night stop and he had the temerity to call me a dude (yes, a dude!) over the air. This is a typical example of an out of touch commander giving orders without thinking them through and then firing off insults. I could not have worried less. The welfare of my troops came first and they lifted us out. As far as I can remember they never did get any of those gooks either so all-in-all an unsuccessful day all-round and perhaps in some way I contributed to this poor result. I doubt it, although in retrospect I should have been more prepared for this type of call-out though and I would not be caught out again. It was pretty piss-poor preparation on my part. I didnt know it at the time but as we flew back to Wankie there was planning taking place in Bulawayo that would soon see me redeployed to a place synonymous with the history of the Rhodesian Corps of Engineers…..Mukumbura!